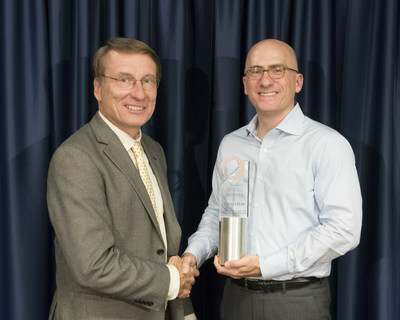 Chuck Ruzicka, Vice President of Research and Consulting at Novarica (left), presents the Impact Award to Jim Williamson, Division President, Small Commercial Insurance, Chubb North America. Chubb was recognized for its innovative and intuitive digital Marketplace platform. WHITEHOUSE STATION, N.J., Sept. 19, 2018 /PRNewswire/ -- The Novarica Insurance Technology Research Council honored Chubb with its Impact Award for the Chubb Marketplace – a digital platform built for and with independent agents. Chubb representatives were presented with the award during a company event held in Lafayette Hill, PA. Selected by a peer community of more than 50 CIOs, Novarica's Council members reviewed dozens of case studies to select the winners for the seventh annual awards. The Chubb Marketplace was recognized for its use of innovative technical architecture, and for modernizing the placement and service of small business insurance. Chuck Ruzicka, Vice President of Research and Consulting at Novarica, presented the award to Chubb, saying, "The Chubb Marketplace was selected by our Council for creating a digital user experience that drives business results. It creates a user experience that allows agents to write business as easily as possible." In accepting the award, Jim Williamson, Division President, Small Commercial Insurance, Chubb North America, shared, "I am honored to receive this award in recognition of our Marketplace. Chubb put a great deal of time and energy into developing the platform's intuitive digital experience, and we are pleased that these efforts have been recognized by both independent agents and this distinguished council of industry CIOs." Williamson continued, "The Marketplace will continue to evolve with the addition of new products and enhancements to help independent agents grow their business." Click here for more information about Chubb Small Commercial Insurance. The Novarica Research Council Impact Awards are the largest purely peer-juried awards in insurance technology. Council members vote annually to recognize the efforts of their peers to use technology to drive business value in digital, data/analytics, core systems, and IT operations. No vendors, consultants, journalists, or members of the Novarica team participate in the selection committee, making the Novarica Impact Awards distinctive in being a purely peer-juried award. The Novarica Insurance Technology Research Council is a free, moderated, knowledge-sharing community of more than 300 insurer CIOs and senior executives. In addition to recognizing successful initiatives through the Impact Awards, members participate in anonymized studies and private, vendor-free events. More information at https://novarica.com/council/. The Council is managed by Novarica, a research and advisory firm that helps more than 100 insurers make better decisions about technology projects and strategy through published research, advisory services, and consulting on IT strategy, benchmarking, project assurance, capability and organizational assessments, and vendor selection. https://novarica.com/.